Turning Point - Modeled after the 2008 Turning Point Original Yo-Yo! Over the years World Champion Kentaro Kimura and his company Turning Point have transformed from a small custom yo-yo company into a high end brand known throughout the yo-yo community, and with their latest model Turning Point is paying homage to their roots. 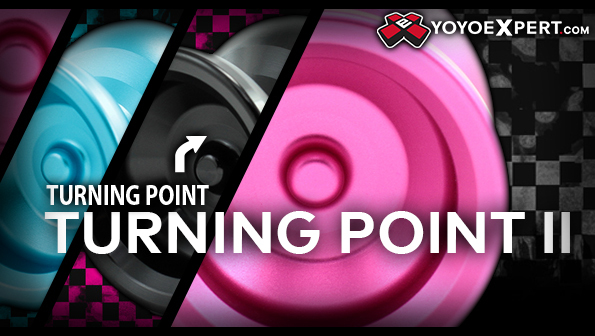 This is the reimagining of the original Turning Point yo-yo - The Turning Point 2! The Turning Point 2 is modeled after the original yo-yo released in 2008 (before Turning Point was even an established company) and refined to meet the level of play expected by the modern players today. The undersized diameter and an extra wide width of the new Turning Point 2 are matched with the proven Turning Point style and performance. This unique combination, along with a nice rim weighted weight distribution, provides the Turning Point 2 with a really fast, maneuverable feel that doesn't lose one bit of that stable and long spinning Turning Point performance you're looking for. Undersized yet powerful, the Turning Point 2 is a really impressive yo-yo. And at this price it's hard to pass up!